Many of the activities in the course were adapted from assignments developed by my amazing instructors at Massachusetts College of Art and Design (thanks in particular to Judith Anderson & Frank Criscione!) The “Adjective Project” served as an anchor throughout the week. 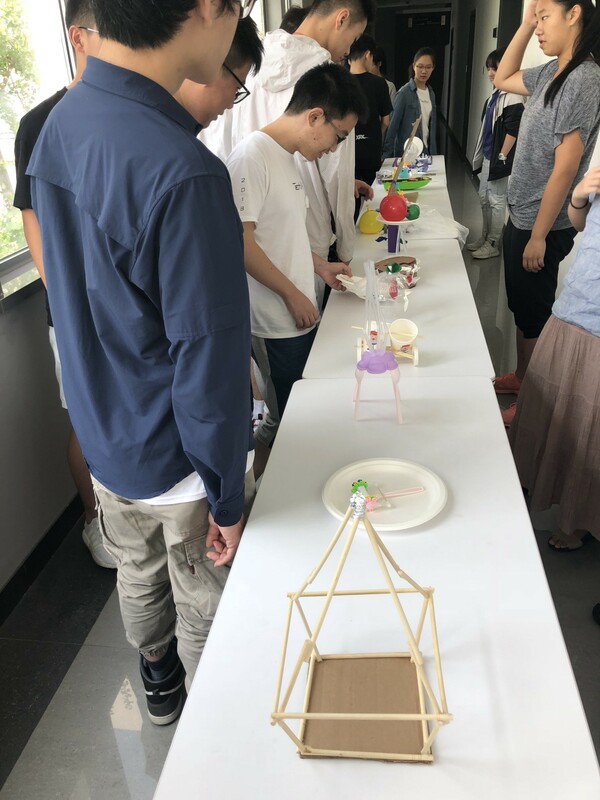 For this project, students were assigned an adjective and asked to incorporate the moods, emotions, and formal qualities conveyed by each word into a series of iterative design exercises. Students also kept a sketchbook for the week — in addition to each assignment, they completed 5 pages of sketching each night (new ideas for products, observational drawings, UI sketching, or form studies). 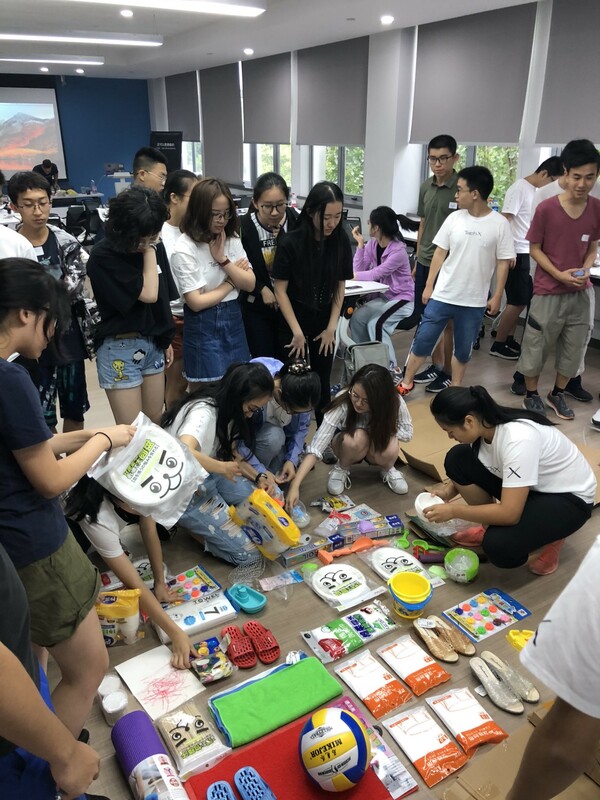 Day 1 – Introduction to Industrial Design: We kicked off the experience with “Trash Club,” a social event I like to host in Boston (more on that in a future post!). Trash Club is like a potluck for materials — everyone brings something to share, and together we spend the day creating objects and prototypes to develop our hand-craft skills and experiment with new ways of working across unusual materials. We ended the class with a group critique to introduce how to give and recieve constructive feedback from others. 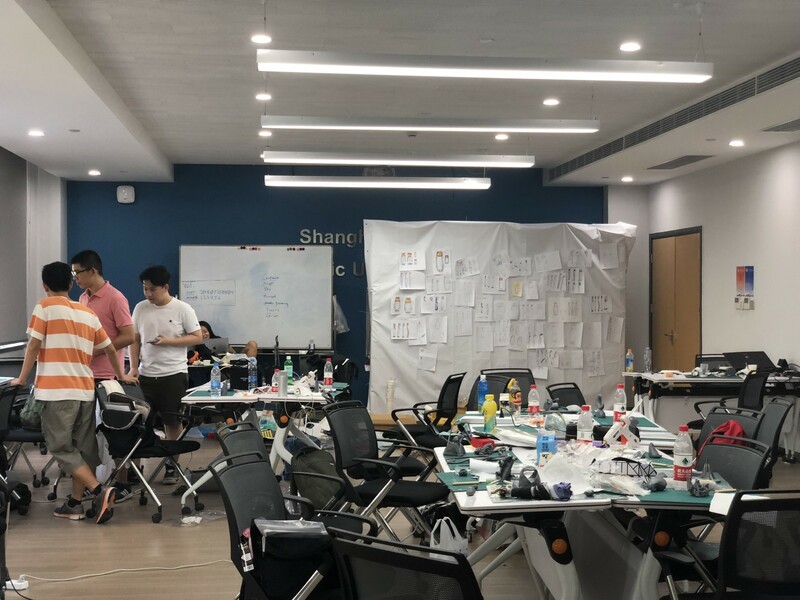 Day 2 – Sketching & Moodboards: We emphasized the utility of sketching as both a thinking and communication tool — how a designer might use it just for themselves to think through problems and opportunities, or as a tool to persuade and educate others. On this day, we kicked off the Adjective Project and assigned students one of five words: angry, grieving, confident, shy, and nurturing (okay…some of these are verbs). After students received their words, they put together moodboards to develop their own personal interpretation of the word and gather inspiration. Me, amazed at the student work! Day 3 – 3D Prototyping & Form Studies: On the third day, we continued the theme of sketching, but this time in 3D. Students used clay to develop a series of “sketch models” to create a sculpture that conveyed their Adjective concept. We pushed students to create abstract forms versus literal interpretations (e.g. instead of a parent holding a baby to convey “nurturing”, what might you pull from that relationship between two bodies to make it less representational?). We had a series of small critiques, where students who shared the same word came together in working groups to get feedback from each other about what was successful and less successful about the design. Then, we ended with a larger group critique where students from different groups tried to guess each others’ words based on the formal qualities of each sculpture. 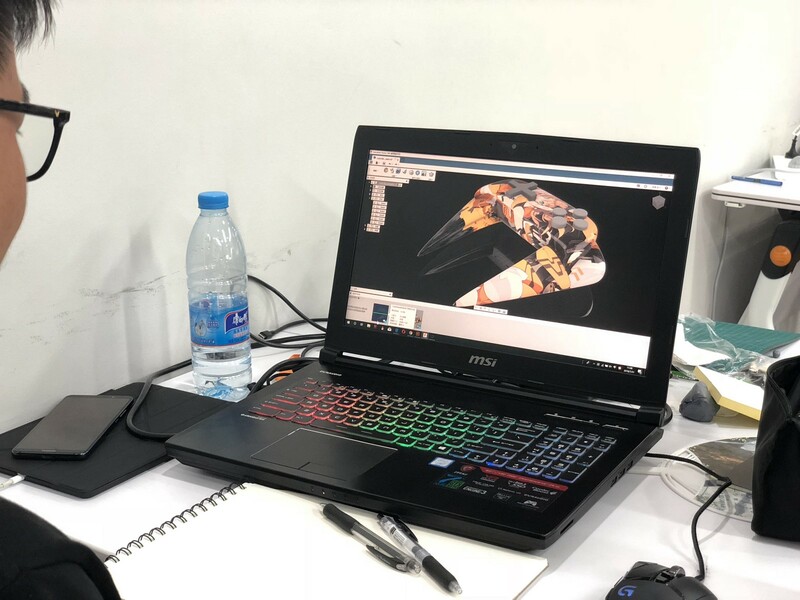 Day 4 – 3D Modeling I: The next two days were devoted to learning technical skills of 3D modeling (using Fusion 360) and introducing the process of iterative design. 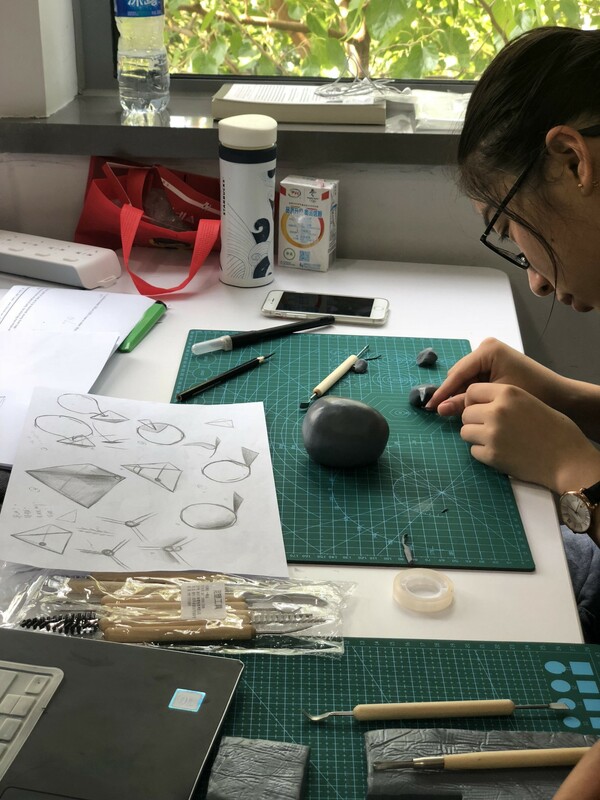 After a brief introduction to the software and some short exercises (making a paperclip, making an egg cup, making a cube inside a cube), we asked students to refine their abstract forms from the previous day based on critique, and translate them into digital models. 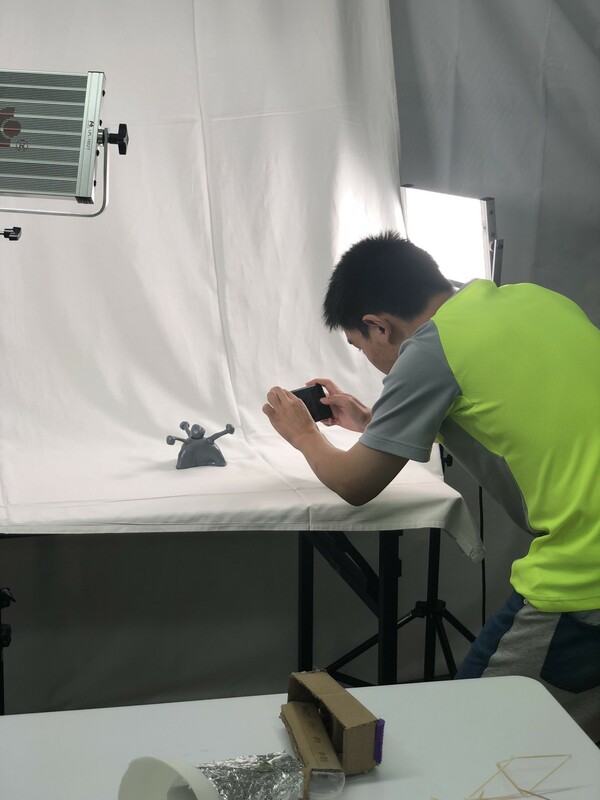 These introductory lessons barely scratched the surface of 3D modeling, and we were blown away by the students’ enthusiasm and ability to pick up the skills needed to model their (sometimes very complicated) forms in the software. 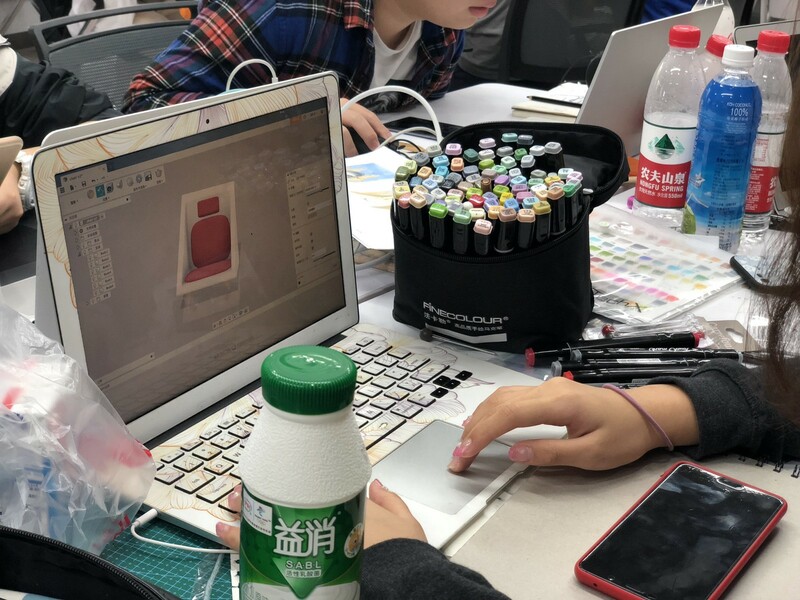 Day 5 – 3D Modeling II: On the second day of 3D modeling, we asked students to translate the formal qualities of their sculptures into a functional product (e.g. a lamp, an office supply, a chair, or a video game controller). Instead of just taking the form from the previous day and adding functional elements to it, our shared goal was to identify specific formal elements from the sculpture to create a visual language that could then be applied to functional forms. 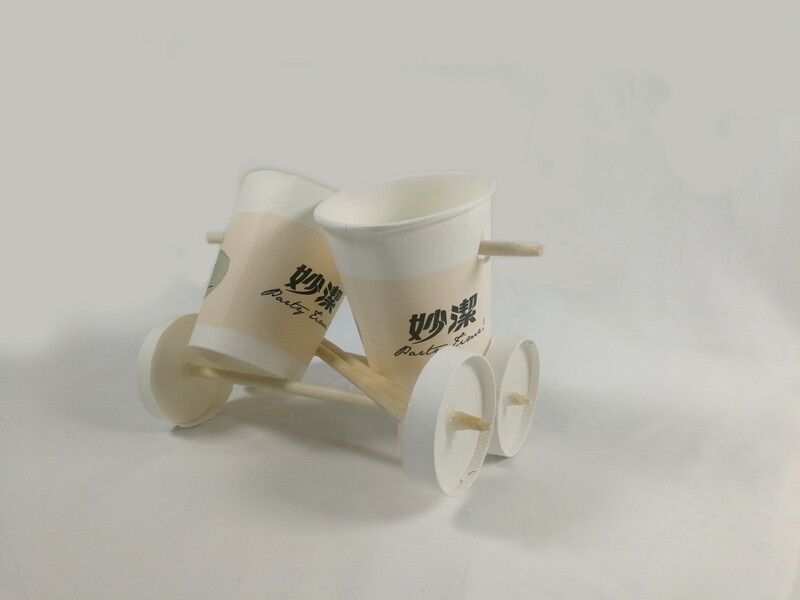 Students went back to the drawing board with sketching on paper, and created ideas for new products. The mashups were phenomenal — students created grieving staplers, shy lamps, confident chairs, angry video game controllers, and more. We discussed that perhaps we would never as designers be called on to create a grieving stapler, but developing a mastery of form and an understanding of how form communicates emotion will allow us to thoughtfully make choices about how our designs make people feel. 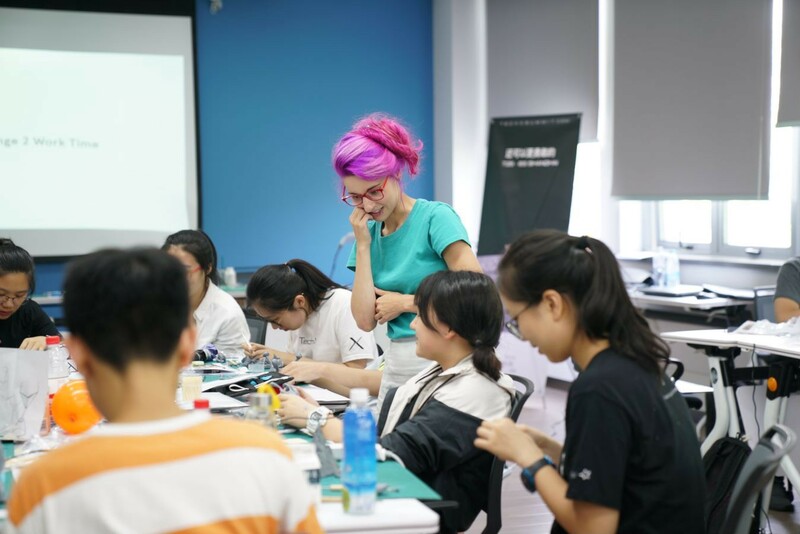 Day 6 – Introduction to Programming & Arduino: Today we shifted gears from the Adjective Project and moved into experimenting with physical computing using the Arduino platform. 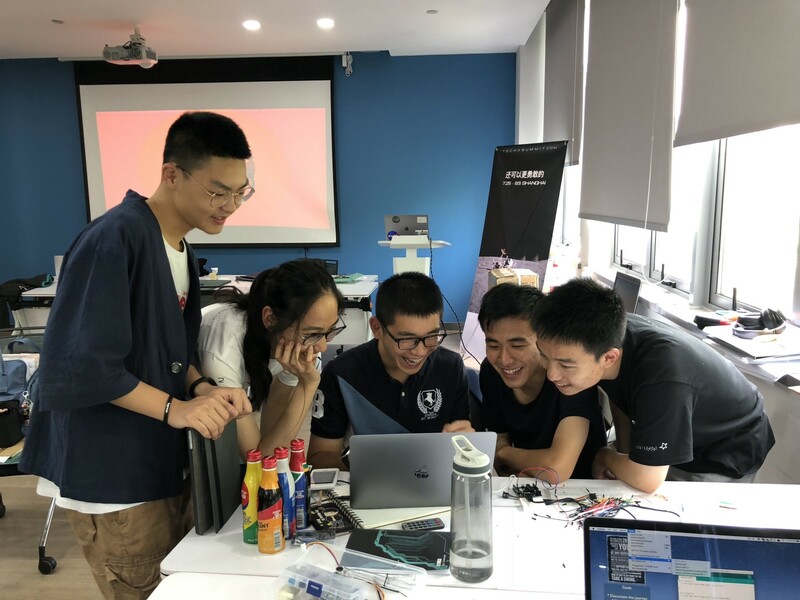 Students were introduced to programming, inputs/outputs with a variety of sensors, and worked in peer-teaching teams to complete a series of short exercises. 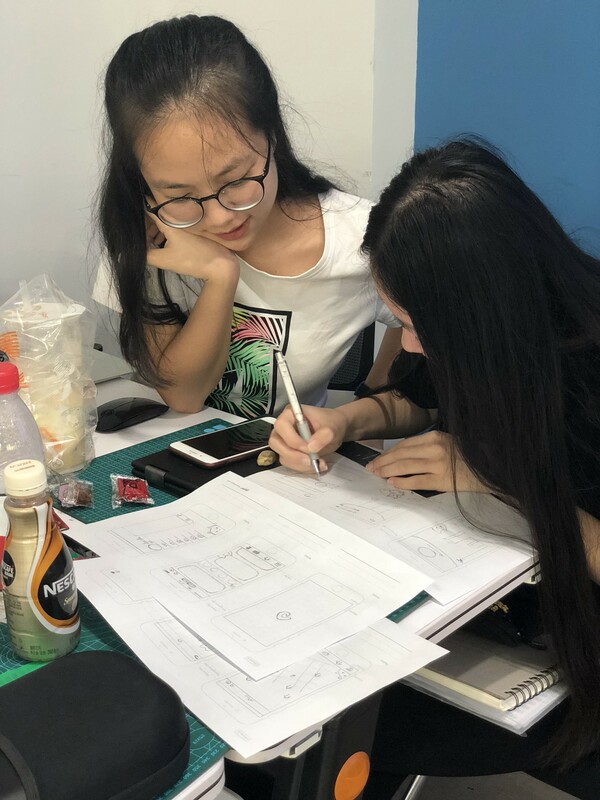 Day 7 – User Interface Design & Usability Testing: Because Industrial Design often blends physical objects with screen-based interactions, we introduced students to UX and UI design. After a short introduction to best practices and examples of successful and unsuccessful interface design, we asked students to create paper prototypes of a wellness app (e.g. fitness, meditation, eating) or another concept of their choosing. After sketching their ideas, students tested their paper prototypes with each other, made changes to their designs, and then developed a high-fidelity mockup using Illustrator, Photoshop, or the Sketch app. Day 8 – Portfolios, Storytelling, & Product Photography: Students did a LOT of work this week, and we wanted them to be able to take home an artifact to demonstrate both their process and the results of their various experiments. Building on the digital design skills they learned from the previous class on UI/UX, students learned about layout, hierarchy, and typography to create a portfolio. We also set up a photo studio with professional lighting (thanks AV team!) so they could take compelling shots of their work to include in their portfolios. 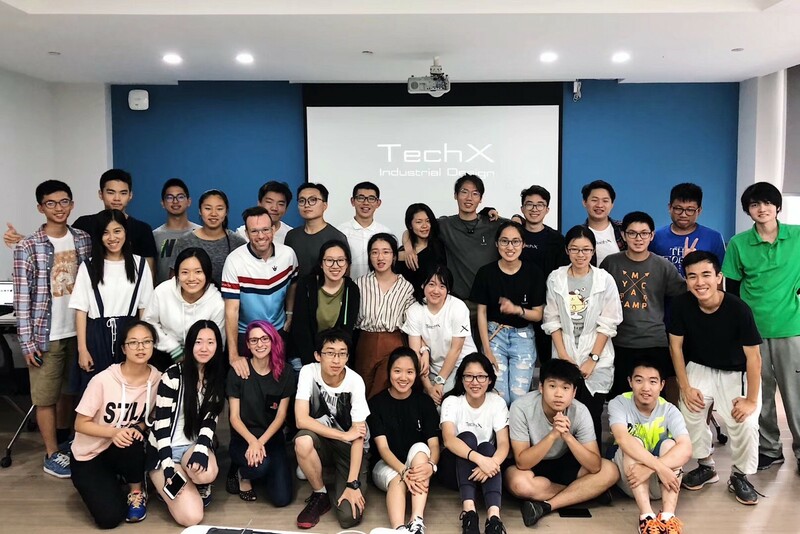 Day 9 & 10 – After the intense eight-day class, our students participated in a two-day hackathon with the rest of the TechX students on mixed teams. It was so exciting to see them embedded in other teams as design experts and using the tools they learned throughout the week to work with others to create functional prototypes. After a science-fair style judging session, the top ten groups shared a formal presentation on stage.